Sunayama Beach on Miyako Island is nothing short of amazing. Having been raised in a land that is recognized for having some of the most pristine expanses of nature and wildlife, I think this qualifies me to critique Okinawa for not exactly being an island dotted with the idealistic white sandy beaches, palm trees and incredible wild life. Albeit, there are a few locations on Okinawa with white sandy beaches, an abundance of palm trees and even birds that soar freely above. Yet, it does not exactly match the vistas of paradise that we all envision, as much of Okinawa’s coastline is covered with concrete ‘jacks’ supposedly against typhoons and erosion. The northern area is close to being ‘pristine’ but something is missing that renders referring to Okinawa as a paradise quite a stretch. 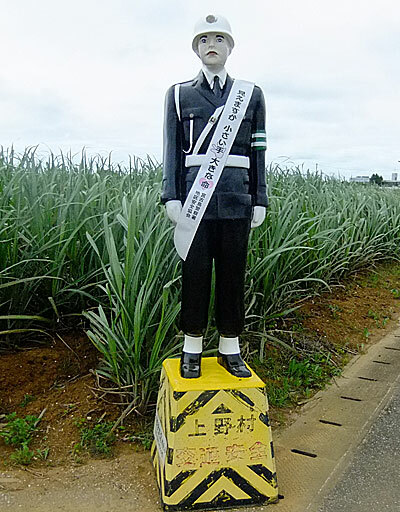 Miyako’s famous ‘Mamoru-kun’ police dolls stand watch along the island roads to warn drivers to watch out. Miyako Island is a place that I would consider an oasis, and it is only a short affordable plane ride away. The best beach on Okinawa would be a 6/10 on the beauty scale but the Miyako Island’s Sunayama Beach is hands down a 10/10 when held up against any of the beautiful beaches I have visited in my life, and my toes have sunk themselves into the hot sand of many a beach on this beautiful planet. If you have not yet visited Miyako Island, you are missing out on experiencing one of the most breathtaking beaches of your life. Not only does Miyako Island have a coastline dotted with white sandy beaches, but it also has a castle. Yes, castle. Not the piles of rocks that are the remains castles or fake reconstructions found on Okinawa, but rather, a real castle. 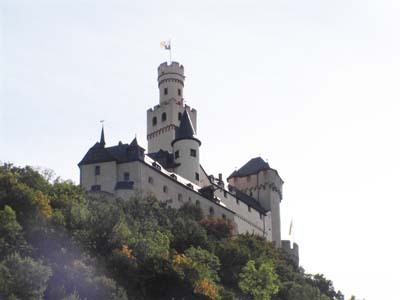 The castle, a replica of the Marksburg Castle in Germany, was built only recently inspired by the memory of a German ship that ran aground on a reef in a typhoon more than a century ago on the island coast and local people rescued the German crew. Anyway, the castle and the German Village theme park around it stand in absolute surreal European contrast to the surrounding Okinawan culture and buildings everywhere else on the island. After you have visited the beaches and castles you are probably wondering what else you could possibly do on an island that you have barely heard about. Well, to be honest, there isn’t much more but to drive around the entire island and take in the views. This task can be accomplished in less than an afternoon. The drive is literally a breath of fresh air as you take in the vast pristine landscape of Miyako Island. It is a closer rendition of how we dream a tropical island’s beauty should appear. In the evenings, the residents of Miyako Island are known for enjoying their alcohol. It seems as though the local police have all but given up enforcing the drinking and driving law by erecting fake police mannequins locals have named “Mamoru-kun” at select intersections to remind people that the police are ever present and watching, although not in the physical form. But a word of the wise; when in Rome drink the local drinks, but do not drive. FYI, the local Miyako Island’s drink of choice is awamori, and plenty of it, and of course, everyone loves beer. If you have lived on Okinawa and not yet ventured over to Miyako Island, you are really missing out. The flights are incredibly cheap, and the hotel costs are reasonable. To rent a vehicle is ¥2,000 a day that is the cheapest price I have ever paid for a rental car in my life. 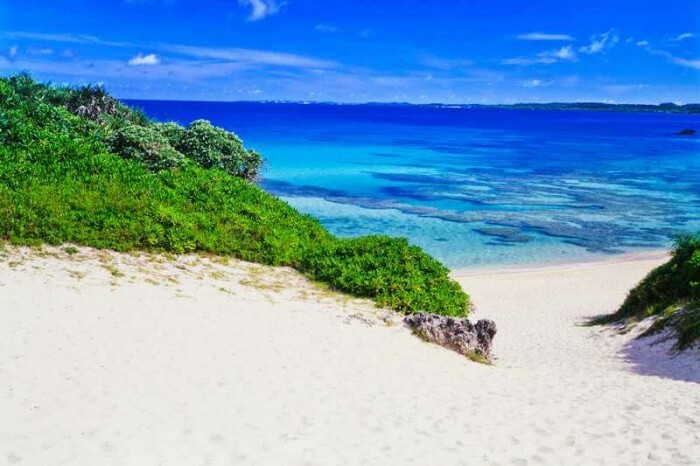 You will be blown away by the beauty of Miyako Island and thankful that you took the time to explore beyond Okinawa’s perimeters to a place where the wonders of this island’s natural beauty make time stand still and rejuvenate your spirit, if only for a short time.